Some days I tend to get 'brain freeze' as what N calls it and I can't think of what to pack for lunch. It usually happens during beginning and end of the month when I am super busy with work. So, here is a simple lunch that I made for today. 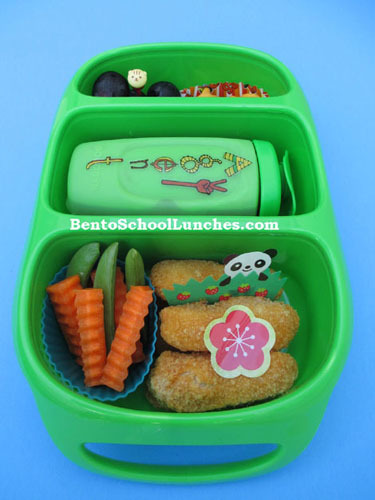 In this bento: The top section contains seedless black grapes and goldfish cheddar crackers. Middle section has a drink bottle with V8.V.Fusion. Bottom section contains sugar snap peas, crinkle cut carrots and all natural chicken breast tenders. Packed in Goodbyn Bynto. ooo I love those picks! !